There was a plan and it fell apart at the seams. It simply was not meant to be, well, yet. Circumstances collided and got in the way of me posting a lovely salad recipe. It’s just been one of those weeks. Yet a good thing happened in the process. I finally got the reason to tackle making something I’ve wanted to for ages. 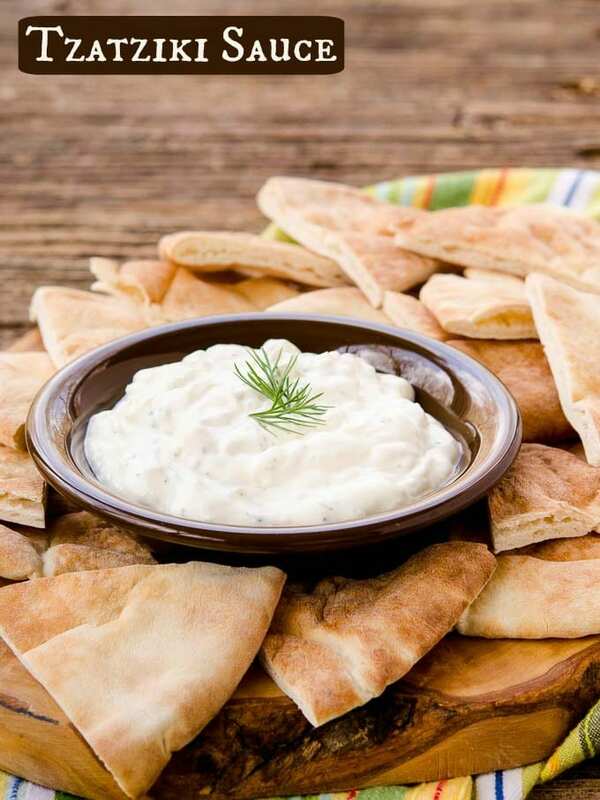 Now I have a batch of creamy Tzatziki sauce to use with lots of things in the days to come. So what happened with that salad? I started with preparing the protein part of it one day. I wanted it cooled down so it would not wilt the greens. Because, you know, sad looking greens are not good for photos. Chilling it overnight would work nicely. Plus I thought I would take the opportunity to make the dressing so it could chill for a while too. The dressing was a disaster. It was awful. I was using a recipe from a magazine as a guide. Whoever thought buttermilk and Greek yogurt would work together is sadly mistaken. The tangs tangled and no amount of other flavors would help. Believe me, I tried lots of variations. So that dressing was scraped. I figured I’d work on another one the next day. Then a phone call put everything on hold. My mom had fell during the night and could not get up. Her helper found my mom on the floor when she arrived that morning. She called 911 then me. I immediately left for the hospital. Mom’s heart was not beating normally and she had a mild heart attack. A few days later her heart was back to beating as it should. She was discharged and back at home under 24/7 in-home care. 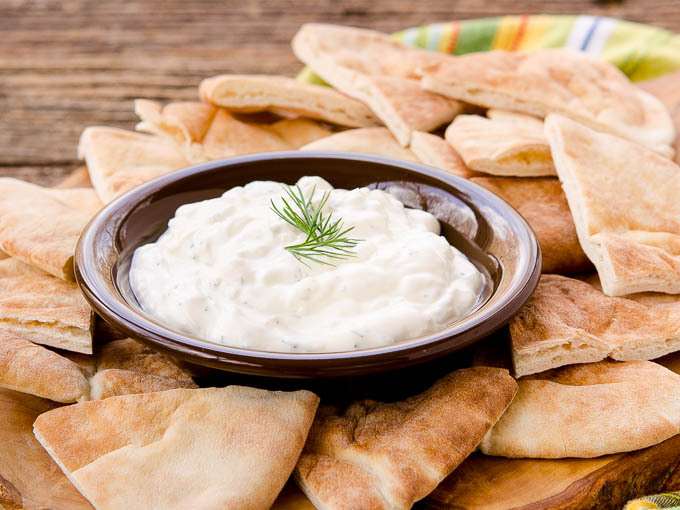 How did tzatziki sauce come along? I thought of it while sitting with my mom at the hospital. It would be the perfect dressing for the salad. Yet it deserves a post all on its own. Why? Because it is something quite versatile. 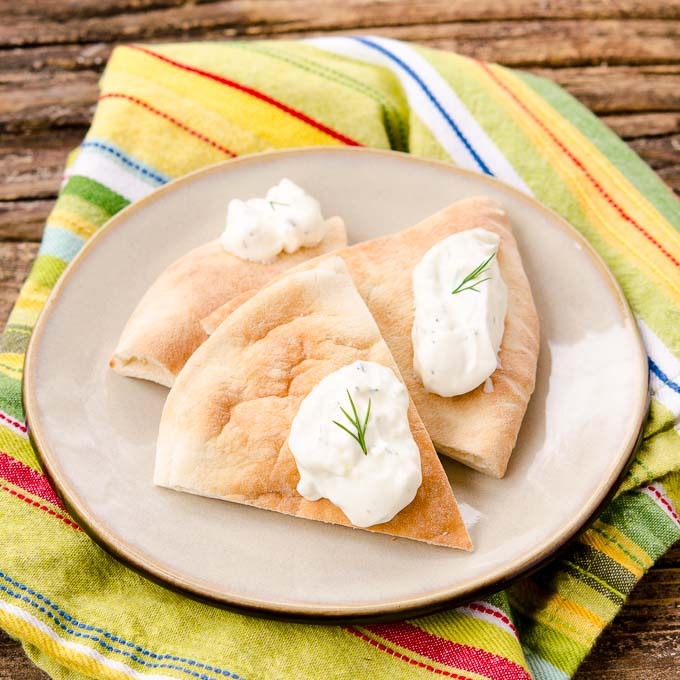 It’s a marvelous dip for pita bread or vegetables. As a sauce it pairs beautifully with grilled meat or kebabs. Plus it’s the sauce for gyros and would be fantastic in wraps. Oh, now I’m even thinking of using it on Greek burgers or sliders. See what I mean? So many possibilities. 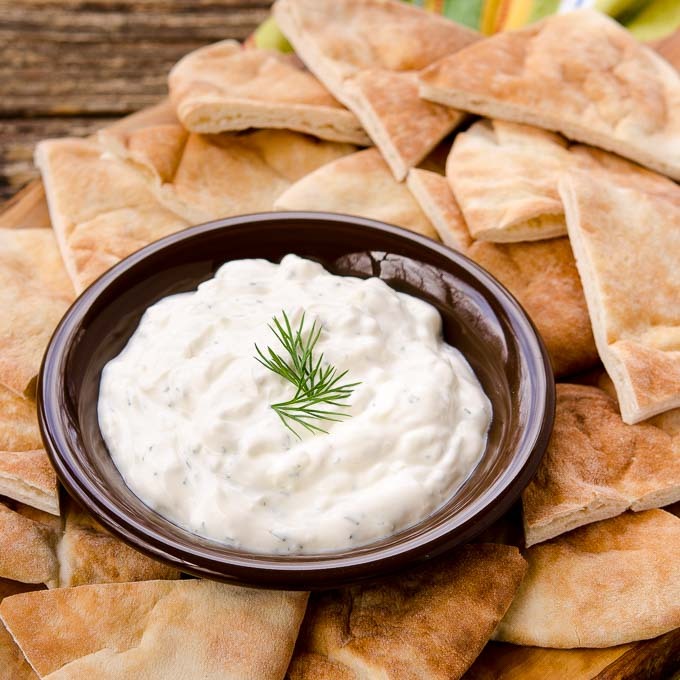 Tzatziki sauce is a Greek yogurt cucumber sauce flavored with dill, lemon, and garlic. Serve it as a dip or dressing with pita, grilled meat, or salad. Peel cucumber and remove seeds. Lay a cheesecloth on a work surface. Grate cucumber onto the cheesecloth. Pull up edges of cheesecloth and squeeze liquid from cucumber. Place cheesecloth with cucumber in a sieve or strainer over a bowl. Sprinkle 1/4 teaspoon salt over cucumber. Toss to coat. Allow to set for 30 minutes. Pull up edges of cheesecloth again and squeeze liquid from cucumber. Transfer cucumber to a medium bowl. Add remaining ingredients and stir to combine. Cover and chill for at least 1 hour. Garnish with a drizzle of olive oil, fresh dill, or cucumber. This sauce looks so good!! I love it and I can’t wait to try it out.